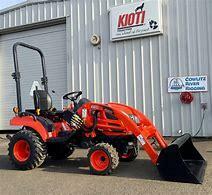 BRAND NEW KIOTI Tractor CK2610 with Loader! The CK10 Series is fully featured, comfortable and ready for any job that demands a durable compact tractor. With 24.5 horsepower, this series of high-performance compact tractors pack impressive power and smooth handling into one dependable workhorse! Priced with loader at $18,299!